Businesses should consider making expenditures that qualify for the business property expensing option. For tax years beginning in 2017, the expensing limit is $510,000 and the investment ceiling limit is $2,030,000. Expensing is generally available for most depreciable property (other than buildings), off-the-shelf computer software, air conditioning and heating units, and qualified real property-qualified leasehold improvement property, qualified restaurant property, and qualified retail improvement property. The generous dollar ceilings that apply this year mean that many small and medium sized businesses that make timely purchases will be able to currently deduct most if not all their outlays for machinery and equipment. What’s more, the expensing deduction is not prorated for the time that the asset is in service during the year. 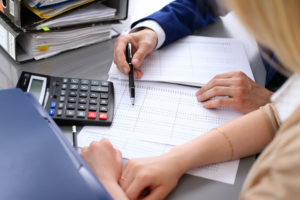 The fact that the expensing deduction may be claimed in full (if you are otherwise eligible to take it) regardless of how long the property is held during the year can be a potent tool for year-end tax planning. Thus, property acquired and placed in service in the last days of 2017, rather than at the beginning of 2018, can result in a full expensing deduction for 2017. Businesses also should consider making expenditures that qualify for 50% bonus first year depreciation if bought and placed in service this year (the bonus percentage declines to 40% next year). The bonus depreciation deduction is permitted without any proration based on the length of time that an asset is in service during the tax year. As a result, the 50% first-year bonus writeoff is available even if qualifying assets are in service for only a few days in 2017. Businesses contemplating large equipment purchases also should keep a close eye on the tax reform plan being considered by Congress. The current version contemplates immediate expensing-with no set dollar limit-of all depreciable asset (other than building) investments made after Sept. 27, 2017, for a period of at least five years. This would be a major incentive for some businesses to make large purchases of equipment in late 2017. If your business qualifies for the domestic production activities deduction (DPAD) for its 2017 tax year, consider whether the 50%-of-W-2 wages limitation on that deduction applies. If it does, consider ways to increase 2017 W-2 income, e.g., by bonuses to owner-shareholders whose compensation is allocable to domestic production gross receipts. Note that the limitation applies to amounts paid with respect to employment in calendar year 2017, even if the business has a fiscal year. Keep in mind that the DPAD would be abolished under the tax reform plan currently before Congress.